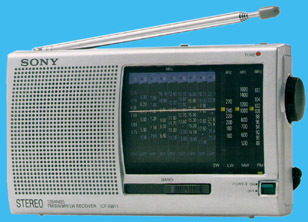 The Sony® ICF-SW11 analog portable covers longwave (141-290 kHz), medium wave (525-1620 kHz), FM and nine shortwave bands: 4.75-5.06, 5.9-6.2, 7.1-7.35, 9.4-9.99, 11.6-12.1, 13.57-13.87, 15.1-15.8, 17.48-17.9 and 21.45-21.75 MHz. FM stereo is featured to the earphone jack. Features: 2¼ inch speaker, wrist strap LED tune indicator, flip stand, 3 VDC input jack and stereo earphone jack. Includes Sony Shortwave Wave List. Requires two AA cells (not supplied) or 3 VDC. Titanium colored case 6.4 x 3.7 x 1.4 inches 12 oz. (162x94x35mm 340g). One year limited warranty.